So you want a little garden – but you don’t have a rototiller, much space or a lot of time? No problem – just get yourself a bale of straw and a few bags of topsoil – and get into gardening now! So many people want to start a little garden – but are a little daunted by the task of putting it into motion. Here is an easy to follow recipe for a salsa garden that can be planted in about an hour – using a space only 18″ wide by 8 feet long! No rototiller needed – and no backbreaking work! It’s just a no-fuss, easy to maintain space that will provide fresh eats for you, friends and family! This little garden should grow enough ingredients to keep you in a steady supply of fresh tomatoes, peppers and salsa from mid summer to fall – and get you started on your way to great gardening! So, if you have a little plot of green yard somewhere that’s around 18″ wide and 8′ long – try it out! For about $20 and a few minutes of watering through the summer – you can have a great little garden. Start by finding the sunniest location possible in your yard. If your limited to spaces with a lot of morning or afternoon sun – choose the afternoon. Tomatoes and peppers like it hot and sunny – and that afternoon sun is the perfect choice. Mark out a strip about 18″ wide and 8′ long. Shovel and spade the soil and turn it over. 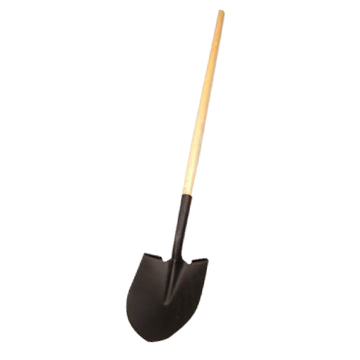 No need to get crazy here and remove all of the grass or weeds – or rake out anything….just a quick spade and a few chops of the soil to uproot the soil is all you need. 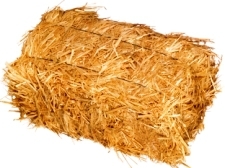 Next – Take 3/4 of the straw bale and loosely make a row about 12 to 14″” wide and about 12 to 18″ high of the scattered straw for the entire length of the 8′ row. Loosen it as much as you can. Once you have your straw in a row – simply open up your bags of top soil and pour over the straw in an even layer – you should be able to have at least a good 3 to 4 inches of topsoil over the straw. Now mark out your places for your plants using the above chart spacing – spread the topsoil aside and plant the small plants directly into the straw – if you need to add a little topsoil into the hole that’s fine – but it’s okay to plant right into the loose soils and straw mix. Fill in around the entire plant with the topsoil. 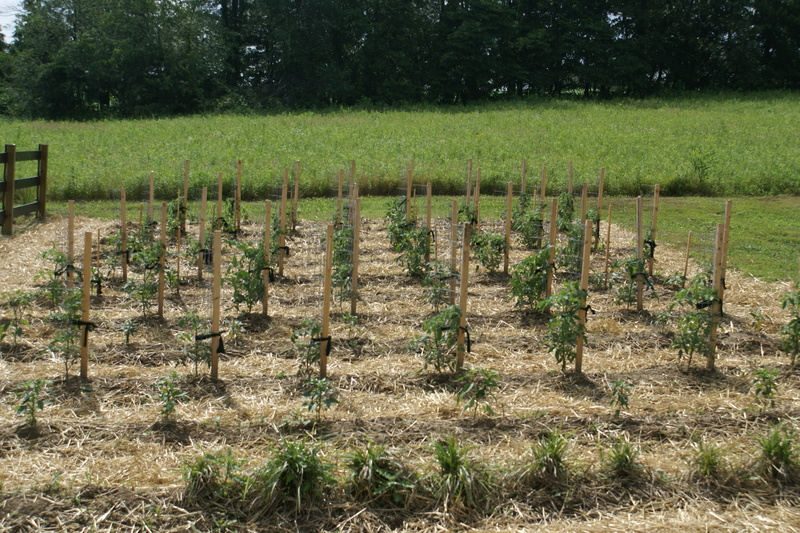 For the seed portion of the bed – plant right into the topsoil that is above the straw. Just use your finger to make a small row in the topsoil and spread the seeds according to the package, and cover up with topsoil. 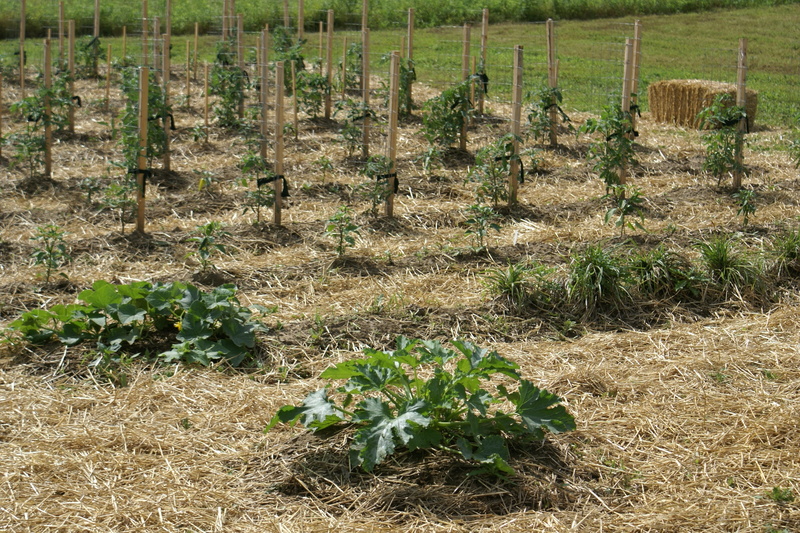 All thats left is to mulch the bed lightly with the remaining straw – water – and your done! The straw and topsoil acts as a great moisture retainer for the plant’s roots, and allows them to spread and grow quickly. As the roots grow into the straw – they will go even deeper in to the loosened soil and give great results! Don’t step in your raised straw rows – ever! By allowing the straw and dirt to be untouched and untrampled – you truly get amazing root growth – which leads to amazing top growth! I am always amazed each year when we pull the plants from the garden how big the roots grow in the undisturbed and loose straw / topsoil rounded beds we use. We never ever have to step in our rows – in fact in our garden we straw the paths as well to keep out weeds and can walk the rows and let the raised mounds of dirt untouched. 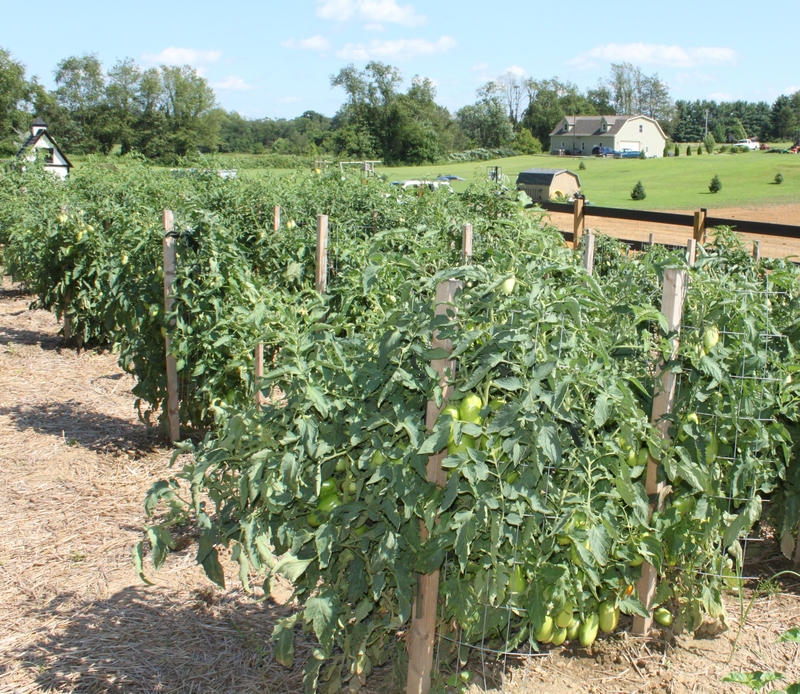 As your tomatoes start to grow – find an inexpensive stake and tie them up to keep them strong and growing – you can also use an inexpensive tomato cage too – just use something to keep the tomatoes off the ground. By mounding the beds and strawing between plants – you REALLY cut down on weeds! Spend a few minutes a week to keep your raised bed free of weeds. Weeds compete for nutrients – so get rid of them. It only takes a few minutes a week to keep the beds free of weeds. Its even easier because of the loose topsoil and straw mixture. Water. This system of growing really helps the plants retain moisture – but make sure they get a good dose of water every few days in the hot summer months – especially when they first get started. Water at the base – slowly to let the water sink in – and to avoid the plants getting their leaves burnt by watering the whole plant in the sun.